There’s tension and excitement in the night air. Everyone around you is hustling with anticipation. The tractors are loaded with empty bins, the floodlights are beaming, and the gloves are on. This is the Icewine harvest. Icewine, popular for its sweet, fruity taste, unique syrup-like consistency, and rich aromatics, is a dessert wine made from pressing frozen grapes. Grape varieties commonly used for Icewine are Riesling and Vidal, because their thicker skins offer more protection against harsh temperatures. 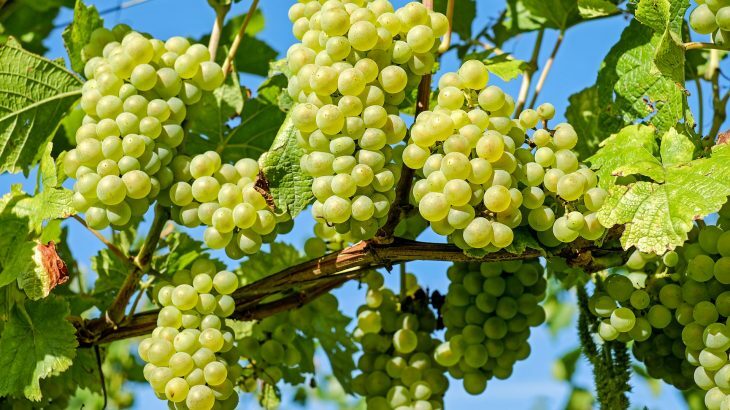 Riesling grapes have high levels of natural acidity, which balance the sweetness of the finished wines. Vidal grapes are well-suited to Icewine because of their late maturity and superior resistance to rotting. Timing the harvest of grapes for Icewine is notoriously difficult. For this reason, producing it is risky for wineries. 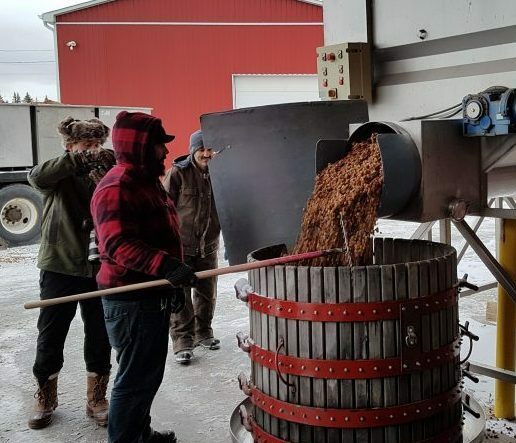 For ordinary table wines, the grapes are harvested in the fall but it’s important for Icewine grapes to be completely frozen when they are picked. In Canada, this usually occurs around December or early January. Ensuring that the grapes freeze at temperatures below –8°C is crucial, as the sugars and other dissolved solids do not freeze, but the water does. During pressing, much of the water (now ice) is retained with the grape skins and both ice and skins are discarded, allowing winemakers to extract a juice more concentrated in sugars, acids, and aromas. While the concept is simple, the reality of harvesting frozen grapes is fraught with difficulties. If temperatures are too warm, the grapes won’t freeze. If too frozen, no juice can be extracted when pressing the grapes. If the freeze comes too slowly, the grapes may rot. If the freeze comes too quickly, the grapes may not be ripe enough. Since Icewine grapes are harvested late, the grapes may endure wind, sleet, and hail, and can also be damaged by small birds and animals. “Late in the season, we remove all the leaves and we put the nets on, because the birds just have a massive feast, literally metric tons of Riesling in a couple of hours. [And] it’s all up to Mother Nature when we’re going to pick. We’re going to be picking, regardless if it’s the day after Christmas or New Year’s. Whenever that opportunity is there, you go right away,” says Angelo Pavan, Vice-President and Executive Winemaker at Cave Spring Cellars. For vineyards, large bodies of water help modulate temperatures from the extremes by acting as a heat source (during the night and colder months) and heat sink (during the summer and warmer months). The difference in temperature between the land and water produces daily onshore and offshore breezes. Lake Ontario influences the air circulation during frosty conditions over the Niagara Peninsula and up to the Niagara escarpment. The location of the vineyards, with slopes descending towards Lake Ontario, allows for cold air to sink and flow down away from the vines. The ideal conditions to produce grapes suitable for Icewine are enough sun and heat during summer and fall to accumulate sugar and ripen the grapes, with consistently cold temperatures during winter to freeze them. Ontario, with warm summers and reliably cold winters, is well-suited to Icewine cultivation and is Canada’s largest exporter of Icewine. With white wine grapes such as Riesling, the grapes change colour from green to brown due to oxidation of the skin. Due to the cold weather, the grapes are preserved and do not rot easily. The brown colour is a visual cue for wineries that the grapes are ready for harvest. Harvesting is usually done at night. Historically, the best time to determine harvest was more ‘best guess’ than a true science. 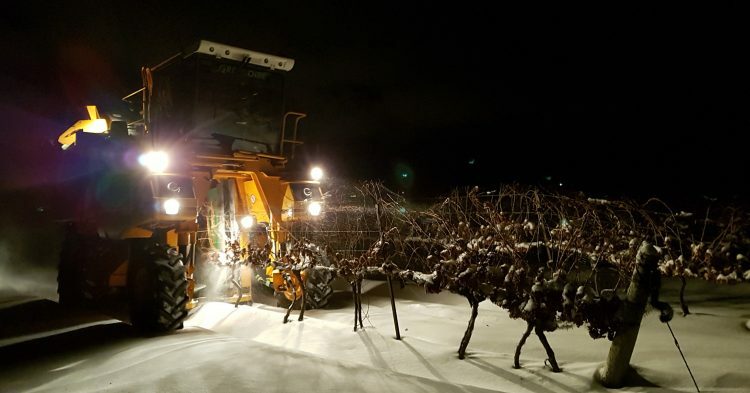 Now, with weather forecasts and temperature sensors, along with tractors, harvester machines, and hydraulic lifts, wineries can accurately predict weather, expedite harvesting, and press grapes more efficiently. Once harvested, the frozen grapes are hydraulically pressed at a much higher pressure than those harvested in the fall. To avoid thawing, pressing is usually done immediately and often outdoors. Ice is retained as a solid mass, and a small amount of concentrated juice is extracted. The juice from Icewine grapes is only around 15 per cent of the expected yield from grapes for other wines. While some wineries don’t filter the juice for their house wines, Icewine juice has higher levels of sediment than other grape juices. As the sediment may affect how the wine ages and introduce an unpleasant taste, wineries separate the sediment from the Icewine juice. Winemakers wait until solids have settled to the bottom, and remove sediment by filtering the liquid through filter pads, or sometimes use a centrifuge before putting the liquid through a rotary drum vacuum filter to separate the solids from the liquid. Afterwards, winemakers “rack” the liquid by transferring it to another vessel. Racking can happen several times, including before and after fermentation. Fermentation gives wine its alcohol content. During this process, yeast transforms the sugars in the juice into ethanol and carbon dioxide. 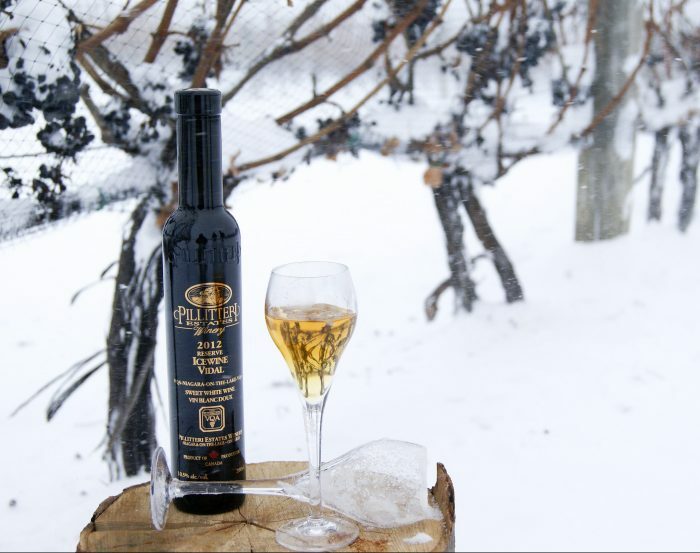 Ironically, the extremely high sugar content of the Icewine juice is a hostile environment for the yeast, and fermentation ceases at approximately 10% alcohol by volume. While juice can begin fermentingwith wild yeasts in the air, most winemakers replace the wild yeast with a commercially cultured yeast to ensure consistency. After the Icewine’s slow fermentation (usually over the course of several weeks to months), the winemaker can age the wine in wooden barrels, steel tanks, or large glass bottles before it’s ready to be bottled and sold. The journey from vine to Icewine is a delicate balance of weather and time, with winemakers considering temperatures, winds, and birds. As Slingerland says, “Our family and many families have sweat[ed] blood to produce icewine. It is a constant battle against nature.” It’s certainly worth raising your glass every time wineries successfully produce Icewine. Angelo recommends trying Icewine with food, such as goat cheese or foie gras, or drizzled on a fruit salad. Cheers to that! The author thanks Angelo Pavan from Cave Spring Cellars and Jamie Slingerland from Pillitteri Estates Winery for graciously taking the time to answer questions during the hectic harvest season. Quotes have been edited for length and clarity. Grateful thanks to Jeff Letvenuk from Pillitteri Estates Winery for providing photos. Chemistry, General Science, Science in Society Cave Spring Cellars, Connie Tang, fermentation, ice wine, icewine, Pillitteri Estates Winery. permalink.